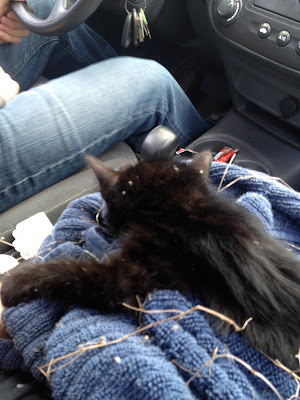 Today, we had an adventure with a little kitten. After listening to Mac bark his head off for about 10 minutes, I ventured outside to see what all the fuss was about. There's a little wooded patch right behind our fence, and he was focused on something in the bush. So, I peeked in and noticed a little black kitten. But, it was strange because the kitchen was not moving. Breathing, but just laying there. She (I'm going to call the kitty a she!) would jerk a bit when Mac barked, but other than that, she was helpless. My heart just went out to the poor thing, and I knew I couldn't let her stay out there. I wasn't sure if she was injured, sick, or just sleepy. I called Josh out and told him that we needed to save the kitten. Since we were ready to leave for church, he went and changed and then figured out a way to get to the kitten (there's quite a bit of bush/sticks...etc). Just before he got to the kitty, she started wiggling like crazy and meowing. I thought she was scared of Josh and felt trapped, but after about 10 seconds, she stopped and was lethargic again. Josh picked her up in a towel, and we went on our way to the only open animal clinic in town: A&M's Small Animal Clinic. I held her, pet her, loved on her a little, and named her. I know you should never name something because you might get attached. But, I named her anyway. We brought her in, gave her to capable hands, filled out a form (since she was a stray), and left. I don't know if we'll ever know what happened to her, but I'm making up a lovely story about how she is nursed back to health and goes on to live a happy, sweet life :) Even if they do put her to sleep, at least she was loved for a little bit and we did everything we could for her! Apart from our adventure with Licorice, this week was a lovely week! Caught Mac on the bed! Doesn't he look guilty? Enjoyed the perks of pregnancy. I still don't feel like I look all that pregnant, so I felt a little guilty about taking up the spot!